The biblical Book of Ruth begins with a heartbreaking journey. Having lost her husband and two sons while abroad, Naomi mournfully returns home to the Land of Israel. She tells her Moabite daughters-in-law to turn back. But Ruth refuses, saying: “Where you go, I will go…your people shall be my people, and your God my God” (Ruth 1:16). These famous words were spoken by the Bible’s most faithful traveling companion. Do you wish that you had a fellow traveler to guide you on your journey through Scripture? We at The Israel Institute of biblical studies offer you the unique opportunity to study Hebrew online with an expert instructor live from Israel. Using today’s most up-to-date technology, you will gain direct access to the oldest truths preserved in the Bible. From the comfort of your home, you will acquire the practical skills to smoothly navigate your way to Scriptural comprehension. Make your voyage through Scripture effortless and full of meaning by allowing our expert teachers to serve as your guide. 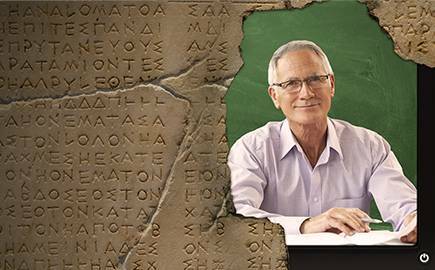 Enroll in our upcoming live online Biblical Hebrew course today.